The most common upgrades users can do to their PCs over the years have included adding additional RAM, or maybe a new video card, and for some the option to upgrade your hard drive from a 5400RPM drive to a 7200RPM drive. The lucky few who can afford the option to upgrade to a Solid State drive are limited to SSDs with little storage space due to present prices per gigabyte. The only SSD drives that are affordable to most end users are merely 80GB SSDs which is pretty small and doesn’t leave much room for applications and/or games. There is a new option on the market provided by Seagate® called Momentus© XT which is a hybrid drive which has the storage of a SATA and SSD-like performance. If your looking for a small form factor hard drive with better performance than a 7200RPM drive, the storage capacity of SATA drive, than think Hybrid. The Momentus© XT, a 7200 RPM hard drive with 32MB Cache and a 4GB SSD in one drive is a new product to the market and is quiet impressive. The price point is focused to be less in cost than a large capacity SSD and perform faster than a standard 7200RPM spindled SATA drive. The size of the 7200 RPM drive are 500GB, 320GB, 250GB which is plenty of space for those who are looking for a drive to store large amounts of data. Solid state hybrid drive delivers SSD-like performance with hard drive capacity options. Adaptive Memory™ technology customizes performance by aligning to user needs for overall improved system response. 80 percent faster performance than traditional 7200-RPM drives in PCMark Vantage benchmark scores. Low heat and vibration – quiet operation without giving up storage capacity and affordability. You have a very valid point with the exception that we compared it against a 5400rpm drive on purpose. 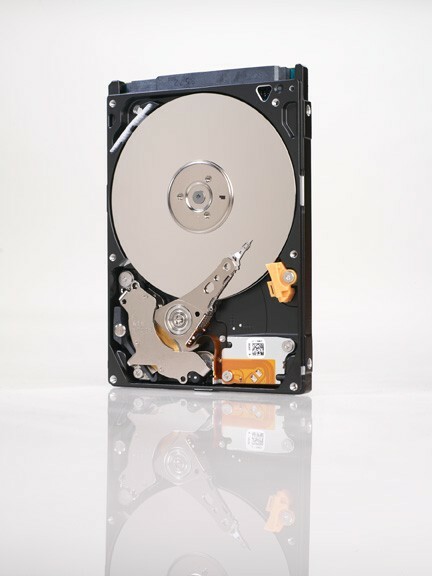 Traditional SATA drives included with most notebooks today are 5400rpm. This drive is intended as an economical upgrade that is no where near as expensive as an SSD and yet offers similar performance. Most users will be more interested in the performance they will gain over their existing drive than to compare this to a standard SSD. In such cases our comparison is both relevant and conveys value to our readers. What is the point of comparing 5400rpm drive with 7200rpm drive and tell that the 7200rpm puts out positive scores? Besides, did you even check the AAM/APM settings of the drives and match them before the test?